Blockchain technologies have introduced new economic, business, social and technological models that have the potential to have a significant impact on both public and commercial services. As a result, The Department of Public Expenditure and Reform, in association with the Department of Finance held BlockAthon Ireland over the course of two days (the 26th-27th of January 2019) to explore use-cases for the potential application of Blockchain technologies in the Public Service. The purpose of this event was to identify and explore real-life use-cases of distributed ledger technology (Blockchain) to develop a deeper understanding of how and why Blockchain may be utilised to improve current processes, development, citizen user experience, efficiency and more. There were nine teams competing at BlockAthon Ireland. Eight mentors (Blockchain experts) were in attendance and the judges for the event included Blockchain experts, as well as the CIO for the Irish Government. Blockchain is a focus area for the Version 1 Innovation Labs in 2019, and as part of that initiative, we entered into this hackathon. 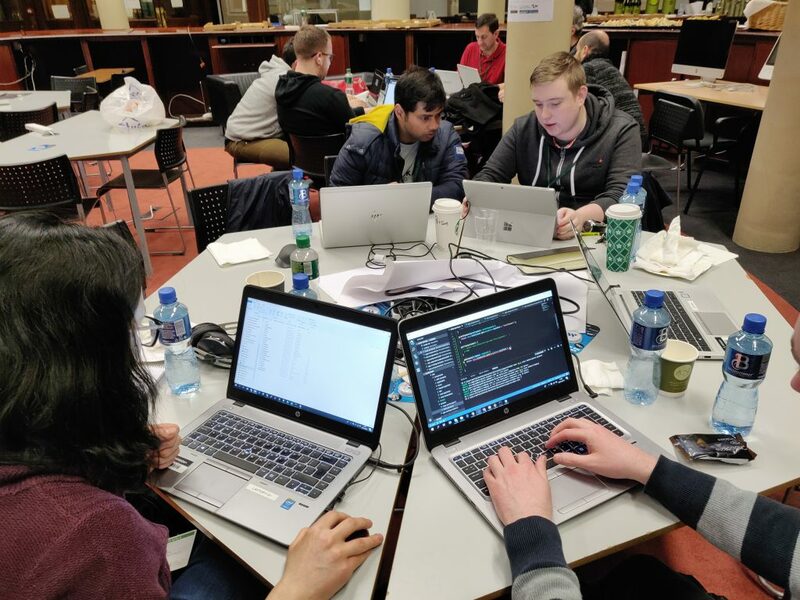 Version 1 consultants and Blockchain enthusiasts Oisin De Conduin, Cezara Molodiuc, Padraic Duffy, Bhaswar Dutta and Mark Caulfield took part in the Blockchain Hackathon. The Version 1 team chose to tackle the Enterprise Ireland sample problem of ‘Grants and State Aid Tracking’ using Hyperledger Fabric Service. Ahead of the event, Version 1’s technology partner AWS provided the team with access to the Hyperledger Fabric Service on AWS Managed Blockchain. “Prior to this event, our Hackathon team hadn’t worked together yet on a Blockchain project implementation, so this was new to us. We all had knowledge of Blockchain concepts and would have studied the technology in the lead-up to the hackathon to make the most of this opportunity to work on real-world applications on Blockchain, which is still a developing concept in our industry. Although this was our team’s first implementation of this technology, we were able to create a working proof-of-concept of the solution.